This uniform kit is for the U10 - U14 age group. These kits have a red jersey. If you are a new player with TAYSA, you must order a complete uniform kit consisting of jersey, shorts, and socks. Your number is assigned by TAYSA. If you have any questions about numbering, please contact uniformdirector.taysa@gmail.com. If you are a returning player with TAYSA, please indicate in the Order Comments section at checkout that you are a returning player and tell us your number. Please note that once your number has been applied to an item it can not be exchanged for a different size. 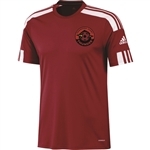 If you are uncertain about size, we have sizing samples at Soccer Stuff that you can try on.